You probably use your smart phone so often that you take it for granted. What you may not realize, however, is that your smart phone can control many kitchen appliances that are “smart” enough to make your daily life much easier, appliances that will look and function great in your new kitchen. Houzz.com identified as a 2019 trend the integration of kitchen appliances with Amazon Alexa and Google Assistant. 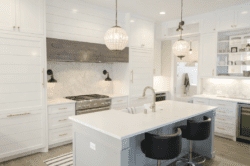 Among homeowners recently upgrading electronics as part of their kitchen remodels, 31 percent added a home assistant, according to the 2019 U.S. Houzz Kitchen Trends Study. So adding “smart” appliances that respond to your commands is the logical next step. If you’re in the planning stages for a kitchen remodel, it’s the perfect time to dedicate some floor and counter space for a smart appliance or two. A smart refrigerator will most likely be your biggest investment, if you decide to purchase smart appliances. They’ve been on the market for a few years now, so any bugs have (mostly) been ironed out. Plus prices have dropped considerably. Samsung’s entry is the fridge with a digital bulletin board, its Samsung Family Hub, and a 21.5-inch screen. Family Hub 3.0 is filled with useful apps, like StickiBoard, a shared calendar app exclusively used on the Samsung Smart Fridge, and Club des Chefs that provides recipes from chefs from around the world. You can create shopping lists, order groceries and see inside your fridge with the view-inside feature from your smart phone, using the Family Hub. It coordinates family schedules, shares photos, streams music and sends messages from your fridge to your family’s phones. The Family Hub integrates Bixby, Samsung’s home assistant, that you can use to ask for a weather report, call for an Uber or control other smart devices, like your doorbell, lights, security system, thermostat or baby monitor, with voice commands. Be aware. When it was first introduced, the Samsung Family Hub fridge cost more than $8,000. Yikes. Now, three years later, the price has come down to the $3,000+ range – an improvement, yes, but still pricey. GE ovens make cooking easier than ever before. Using GE’s voice-controlled assistant Geneva with Alexa or Google Home or the GE WiFi Connect / GE Appliances Kitchen app on your phone, you can do various things, such as preheat your oven to a certain temperature while driving home from work, change the oven temp while helping the kids with their homework, or set and adjust cooking timers while you’re watching the evening news. You can ask Geneva to check the remaining cook time on your roast, notify you when the time is up, and turn off your oven. All of the major appliance manufacturers now offer some version of a smart oven – Bosch, LG, Samsung, Whirlpool, KitchenAid, Meile, even Kenmore – all have joined the connected-appliance marketplace. The choice is up to you, the features you want and the ones you think you need and, of course, how much you want to spend. Although not as expensive as the smart refrigerators, a Wifi enabled built-in oven will cost you in excess of $1000. GE, Toshiba, Whirlpool and even Amazon are all in on the smart microwave game. Now you can do more with your microwave than heat leftovers or pop popcorn. Like other smart appliances, smart microwaves connect to your phone via Wi-Fi, and some models let you control your microwave via voice commands through Alexa and Google Home. You can start cooking from anywhere using your smartphone and receive alerts when food is ready. Your microwave can scan the barcode on packaged food and download the cooking instructions to prepare your food. It tracks your most commonly cooked foods to suggest customized quick settings just for you. It can look up recipes and read steps aloud to you, provide photos of each step, and in some cases, even play short videos of recipe steps. It saves you money with its power-saving mode that turns off displays and reduces energy use when the device is not in use or when you are not home, to conserve energy and save you money. Smart microwaves are more expensive than traditional microwaves, but part of the cost is for features that increase the usefulness of the microwave for more types of cooking options such as toasting, roasting, and air-frying. These features, along with improved technology capabilities, save you on electricity costs. High-end appliance manufacturer Bosch has integrated its wall ovens, hoods and induction cooktops, as well as its refrigerators and dishwashers, with the open-platform Home Connect app. Using this app you can check if your cooktop is on, preheat your wall ovens, monitor the temperature of casseroles in the oven, get notifications when the meal is ready and more — all remotely. The Home Connect app works with Alexa and Google Assistant so you can do all of these things through voice commands. How about this for convenience? Using Home Connect, you can sync your Bosch cooktop with your Bosch range hood so that the exhaust fan automatically turns on when the cooktop is turned on. If you’re remodeling your kitchen, be sure you leave some counter space for a few more smart appliances, such as the Drop scale. 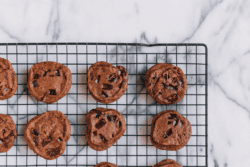 With this scale, you’ll be baking like a pro in no time. The Drop scale puts hundreds of recipes at your fingertips through a user-friendly app. If you don’t have an ingredient, your smart scale will suggest substitutes so you won’t have to run out to the store. Drop’s recipe format is suitable for all skill levels, so you can make and eat what you want at home. Connect your smart appliances to your profile, and Drop will adjust recipes instantly, according to which appliances you own. Choose a recipe, and let the app send the correct times, temperatures, and settings to your appliance at the right moment. Bosch, Kenmore and GE integrate their appliances with Drop, providing you with a way to connect all the smart kitchen devices in your life with one app. Crockpots already make cooking a lot easier, but the Wemo Wi-Fi enabled crock pot makes things even more convenient. You can control this smart appliance using the free Wemo app. You can monitor your slow cooker from your iPhone while you run out to the store, adjust the setting from high to low and turn off your crockpot from your phone while you’re in your backyard relaxing. A smart air fryer deserves counter space in any modern kitchen where healthier alternatives are prepared. You can upload more than 200 recipes to the T-fal Actifry Smart XL, and the air fryer will automatically air fry whatever food you choose to perfection at their right temperature without you having to worry about it. There are new technical additions to the Tefal Actifry Smart XL, as it comes with a Bluetooth function that allows you to control the cooker from your smart phone or tablet through an app. This means you can turn the cooker on to make everything from low fat chips to fish, stews and desserts without actually touching the device at all. If you want a modern kitchen to go along with all your smart appliances, let us create a kitchen design for you. 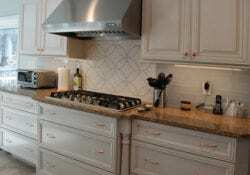 Led by our founder Craig Allen, our team has years of experience with kitchen remodeling. Our designs range from ultra-modern to country, urban and just about every other aesthetic you can think of. To initiate a remodeling project that will show off everything you love about your kitchen, including your smart appliances, contact Craig Allen Designs today.